Edition: The Oxford Shakespeare, edited by Stephen Orgel, 1987.
is not merely a vague substitute for something more specific, but is exact in the restricted and historical sense of the word. These plays belong in matter and tone to a [particular] literature of love and love-making…. We have invented the category of romance because we believe that certain kinds of seriousness are inappropriate to comedy and because we are made uncomfortable by the late plays’ commitment to non-realistic modes. We have, thereby, unquestionably, shed light on the relations between The Tempest and three other late plays, but we have also therby obscured The Tempest’s relation to the rest of Shakespearian comedy. And in our imposition of exclusiveness on Renaissance concepts of genre, we have obscured the plays’ relation to Shakespearian tragedy as well. The Gist, which will obviously involve spoilers: Prospero, the deposed Duke of Milan, has washed up on a desert island with his beautiful daughter Miranda, enslaved the local supernatural beings, and boned up on the magical arts. When a ship with his treasonous brother chances by, he calls up a mighty tempest – hence the name – to shipwreck them. The rest of the play is basically Prospero messing with the minds of his unintentional guests, before revealing himself late in the play and effecting what may, or may not, be a happy reconciliation. The Edition: I like. Orgel’s supporting text is among the most lucid, informative, and interesting I’ve ever read. Well – keep in mind that this is probably the fourth or fifth time that I’ve read the supporting material in a Shakespeare edition. But I’ve read a hell of a lot of academic prose, and this is definitely top-notch stuff. 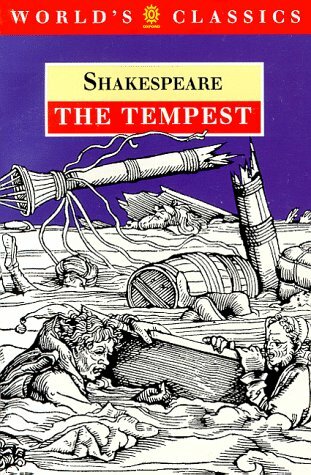 Adaptation: The most interesting thing for me about reading Tempest is that the text does not support some of my strongest impressions of the play. The most significant example concerns the nature of Prospero. I’ve always thought of him as entirely benevolent and wise, haven’t you? Kind of a Gandolf-in-exile? Well, it turns out that the text could allow him to be almost anything but that. He contradicts himself left and right, he is manipulative and occasionally mean, he has quite clearly abused his power over his servants – nice Ariel and nasty but loveable Caliban – and he encourages the bad behavior of others so he can scold them for it later. Even the fact of his exile is not really so very unreasonable; he was too interested in his studies, he freely admits, to put any energy into doing any actual administration back in Milan. This isn’t to say that Prospero is evil, although I think you could legitimately stage the play that way. But the textual Prospero is certainly complex and ambiguous. And by the way, sweet little Miranda isn’t quite as sweet and innocent as you thought, either. Or at least she’s not as sweet and innocent as I thought. A very specific surprise was Prospero’s speech that ends the play. I had somehow got it in my head that it was his pledge to give up magic, to forgive and forget, and to be a good Christian from now on. But that’s not it at all, and in fact there’s not much evidence that he has any serious intention of forgiving and forgetting or of being an especially good Christian, and although he mentions giving up magic a couple of times I don’t think I would want to take him at his word about it. What he really says in the closing speech is that, since the play is over, we as members of the audience are going to have to do the work of continuing the story. Only we can get him back to Milan and figure out what happens to him there. It’s kind of like the “O for a muse of fire” speech that opens, I think, Henry V, except spoken by a character instead of an actor. Very fourth-wall breaking, and kind of charming as well. Prognosis: Great story, great script for a play, tough text to get excited about. If one got to direct or act in these things, there would be a million interesting decisions to be made about the personalities of the characters, depending on what one wanted to say and, of course, how one wanted to entertain. It is heavy going for a reader because, for one thing, there are a clutch of similarly named characters thrown at you all in a mass, and it’s difficult to disentangle who is who and what their various games are. In performance, that’s not an issue; you dress the characters in different colors and give ‘em different mannerisms, and that’s that. Second, there are a number of scenes (including the opener) that are designed as special effects spectaculars, and those make thin reading. Lastly, there’s a lot of expository text; much of “the story” happened a long time ago, and we only know about it because we hear Prospero telling Miranda about it. In performance, this part of the play is also “about” Prospero establishing his character and his relationship with Miranda and his supernatural lackeys. On the page, it’s a little on the dull side. Interestingly, our neighbor Mary has a cat named "Miranda." i pretty much agree with all of this, despite naming my former bike Ariel. I always thought Prospero was the opposite of benevolent. Still, I'm curious to see the Julie Taymor version; I want to see if a female Prospero changes the reading. I'm #20 in line for the Taymor version at the library, and am disproportionally excited about it!